Is personnel management truly different from human resources management? Discuss. I would like to thank Dr. A. K. SRIVASTAVA, my course leader for Human Resources Management for his continuing interest, encouragement, and support in helping me complete this assignment. We are all influenced by the thoughts and ideas of other people which tend to drift into the subconscious and are not always distinguished clearly from one’s own. I have attempted to give references for sources of work by other writers but apologise to any concerned if acknowledgement has inadvertently not been recorded. 8. HRM & Personnel Management-is there a difference? Increasing liberalisation and growth of MNCs in the modern economies has made traditional sources of competitive advantage such as technology, proximity to markets etc. almost common to every organisation and hence the importance of human resources as a distinct competitive advantage has significantly grown. Along with this growth has increased the need for effectively dealing with the various problems faced by employees. The role of personnel management has never been seen as that of a caring and nurturing function and therefore the need for some new management approach , to go beyond the ‘written contract’, was strongly felt. The introduction of human resources management with its approach towards active participation, involvement, empowerment and development soon led to the construction of a significant HRM infrastructure and major emphasis was laid down towards the adoption of HRM policies. Was it really the development of a new approach to the management of people? or Was it merely personnel management under the garb of HRM? Opinions still vary and the debate is still on. However one thing is for sure - businesses can no longer overlook the needs of the worker, and only a wholehearted approach to integrating HRM policies at the top level can ensure their continued success throughout the next millennium. The world today is in an era of globalisation. It has become a battlefield for a variety of organisations trying to ensure continued success in their businesses. The organisation as an entity is going out of fashion and it is being widely recognised that people are not merely one of the factors of production, but are the major source of competitive advantage. The emphasis has shifted from the ‘contract of employment’ to the ‘contract for performance.’ The traditional so-called ‘Fordist’ or ‘Taylorist’ methods are increasingly said to be dysfunctional in relation to the changing context of business. It is argued that the developed economies cannot compete head-on, with their competitors in the Far East and other third world countries, solely on terms of cost. Instead they must put emphasis on the quality of goods and services which can be achieved only through a quality workforce and through a proper way of managing them. This has given way to a new flexible ‘people management technique’. However an organisation’s approach to such new techniques depends to a great extent on how well it fits both in the external and the internal environment and most importantly on the philosophy of the senior management. What is Personnel Management ? a responsibility of all those who manage people, as well as being the description of the work of those who are employed as specialists. It is that part of management which is concerned with people at work and with their relationship within an enterprise. It applies not only to industry and commerce but to all fields of employment. Personnel management aims to achieve both efficiency and justice, neither of which can be pursued successfully without the other. It seeks to bring together and develop into an effective organisation the men and women who make up an enterprise, enabling each other to make his, or her, own best contribution to its success both as an individual and as a member of a working group. It seeks to provide fair terms and conditions of employment and satisfying work.” (Pike, C. and Grenham, M, 1997, p20). Largely personnel is seen as an essentially operational responsibility unconnected with strategic management. On a daily basis personnel managers are confronted by various ambiguities, with respect to the contribution of personnel , as an activity to organisational success. This results in the personnel specialists potential for being scapegoated being raised and the formulation of vicious circles, from which they find it difficult to extricate themselves. Without political support within an organisation any new activity, undertaken by the personnel specialists, aimed at giving the Personnel Department a more adventurous role becomes unsuccessful . Thus the Personnel Department becomes entangled in a vicious circle of information denial, lack of support and credibility. “It is not surprising then that personnel management has an enduring problem of establishing credibility. In the decade of the enterprise culture and into the 1990s HRM is being presented as a model of managing people at work that is more credible than Personnel Management.” (Legge, K, 1995, p28). The latter half of the 1980s and the opening years of this decade saw the development of significant HRM infrastructure and its growing popularity in a wide variety of work contexts. “ As a new set of ideas and practices HRM originated in the US, where in turn, it can be seen as the Americanised version of the ‘Japanese’ methods.” (Storey, J and Sisson, K, 1996, p8). 1. Commitment - HRM policies are designed to ensure the commitment of people to their work and to their organisation. 2. Competence - HRM policies are designed to attract, train and develop the right people with the right skills and knowledge needed now and in the future. 3. Cost Effectiveness - HRM is designed to achieve cost effectiveness in terms of salaries, wages and benefits; and through reduction of turnover, absenteeism and industrial unrest. 4. Congruence - HRM policies seek to achieve consistency between management and employees emphasising values of team work. 1. Integration of personnel policies both with one another and with business planning. 2. The locus of responsibility for personnel management now resides with the senior line managers. 3. A shift in the focus from management - trade union relations to management - employee relations. 4. “There is a stress on exercise of initiatives, with mangers now doing the role of enabler, empowerer, and facilitator.” (Sisson, K, 1990, p4). HRM regards people as the most important asset of the organisation. It seeks to enhance the organisation performance, “employee needs and societal well being.” (Poole, M, 1993, p3 cited by Sisson, K, 1990, p4). “HRM has its hard and soft dimensions. What is striking is that the same term is capable of signalling diametrically opposite set of message. The hard face of HRM emphasises the quantitative, calculative and business strategic aspects of managing the human resources in as rational a way as for any other factor while the soft face emphasises communication, motivation and leadership.” (Storey, J, 1987 cited by Storey, J and Sisson, K, 1996, p8). Considering the various limited developments taking place , it would not be wrong to suggest that these represent the first stages in a more thoroughgoing transformation to HRM . However the process is hindered by a number of critical problems, many stemming from the central question of why is there a tendency for HRM to increase at the expense of Personnel Management ? and is HRM really different from Personnel Management ? · With widespread unemployment, the workplace has lost its aura as a source of personal self-esteem and meeting of personal goals at work is a prospect denied to many. · HRM is a form of “conformist innovation” (Legge, K, 1978, p67 cited by Torrington, D and Hall, L, 1995, p13) which closely identifies with central management interests and conforms to the criteria of organisational success adopted by managerial colleagues, thus repositioning personnel function as more influential. · The prolonged economic recession of the late 1980s stimulated managerial concern in favour of short-term survival tactics and a narrow HRM approach. Only recently is the need for long term commitment being increasingly felt. · Growing external environmental changes and the ever increasing search for competitive advantage has reinforced the tendency for personnel managers to become deployer of resources and knowledgeable about sources, rather than simply users of skills and aware about people. · There is an increased need for personnel activities to be justified in cost terms and the direct allocation of various costs to justify the needs for those activities. · The emphasis of employment legislation has shifted from employee rights towards union containment, thereby lessening the management’s anxiety about labour union pressures. · Devolution of personnel duties to line managers. HRM and Personnel Management - Is there a difference ? “The contention that HRM is proactive rather than reactive, system-wide rather than piecemeal, treats labour as social capital rather than as a variable cost and ultimately based on commitment rather than compliance” (Beer and Spector, 1985; Guset, 1991; Walton, 1985 cited by Blyton, P and Turnbul, P, 1996, p5) suggest that it is ‘better’ than personnel management. 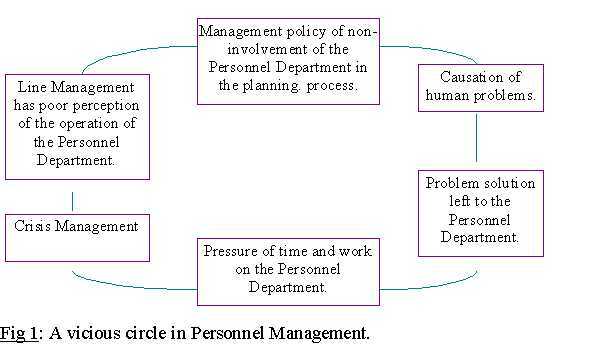 Underpinning personnel management are the twin ideas that employees have a right to be treated properly as dignified human beings in their organisation, they will be effective only when their job-related personal needs are satisfied, and that this is not possible with the intervention of personnel management in the everyday management-subordinate relationship. Whereas underpinning HRM is the central idea that management of ‘human assets’ cannot be left out for specialists to handle, employee’s career and competence needs should be met within a context of efficient management in an environment of mutual respect. HRM’s role is directed towards supporting other managers in their people management and contributing to major strategic change. However this distinction is one over which there is much debate and ambiguity. Large scale surveys have shown that a large number of corporate personnel chiefs claimed to have an overall HR policy, but very few could actually describe it. “Similarly in the UK, there is widespread agreement that, in one way or another, the adoption of HRM has so far been limited to a small number of largely foreign owned, ‘exemplar’ companies; adopting HRM in a very partial and piecemeal way and limited in many cases to a mere relabelling of existing activity and position” (Storey, J and Keith, S, 1990, p65) to give the personnel managers, if not necessarily the personnel function, the status which they have been seeking. · Is it a ‘practitioner driven process’ attracting a wide audience and prompting subsequent analysis? · Is it an ‘academically driven description of the employment relations’ to which practitioners have subsequently become drawn? · Does it essentially prescribe how such a model ‘ought’ to be? · Is it a ‘leading edge’ approach as to how such a relationship actually ‘is’ within certain types of organisations? ( Beardwell, I and Holden, L, 1997, p12). · “Both models emphasise the importance of integrating personnel /HRM practices with organisational goals. · Both models vest personnel /HRM firmly in line management. · Both models emphasise the importance of individuals fully developing their abilities for their own personal satisfaction to make their ‘best contribution’ to the organisation’s success. · Both models identify placing the ‘right’ people into the ‘right’ job as an ‘essential process’ ” . (Legge, K, 1995, p71). · HRM not only emphasises the importance of employee development (what is done by managers) but also focuses on the development of the ‘management team’ (what is done to managers). · Under HRM there is a more proactive role for line managers with greater emphasis on product quality through effective integration of HRM policies with business strategies. · HRM models emphasise that there is a top management responsibility for managing the organisational culture. Further reflection, however, suggest that there are some fundamental flaws in the thinking associated with the new paradigm. The fundamental shifts in attitudes and behaviour that managing the culture or task participation involve is hardly feasible and so is the detailed integration of personal policies practices involved in the paradigm shift. To believe that senior mangers will necessarily accept that the policies and practices associated with the model of ‘HRM organisation’ are as strategically important as suggested is also wrong as organisations are faced with intensifying international competition and there is little evidence to demonstrate that a ‘HRM Organisation’ will necessarily bring the promised return on investment. The strategic models ignore the importance of the various factors as well as the structure within which senior managers exert strategic choice, both in the national context and the supra-national context. A significant division exists between analyses which stress the innovative elements of HRM - claiming to address new ways and methods of managing employees and those which stress the derivative elements -claiming to be no more than a rework of the traditional themes of personnel management . Indeed some writers, mostly Karen Legge, believe that personnel management was beginning to emerge as a more strategic function in the late 1970s before the concept was subsumed under the title of HRM. There is little doubt that the boundaries of HRM overlap the traditional areas of personnel management , industrial relations, organisational behaviour, strategic and operational management. However the HRM perspective claims to atleast present a different perspective on the issue of arranging a range of organisational objectives in a strategic way to enhance the performance of employees in the achievement of these very goals. To conclude “ it would be inaccurate to suggest that one approach has taken over from the other, just as it would be wrong to suggest that one is modern, and the other old fashioned, and that one is right and the other wrong.” (Torrington, D. and Hall, L., 1995, p12). The prescription for managing people may take various formulations such as the flexible organisation, the empowered organisation, the learning organisation, the open company as well as human resources management, but most of the key features are commonly aimed at the development of a highly committed and adaptable work force. Organisations should aim to build the ‘HRM organisation’ by harnessing the co-operation and commitment of others through flexibility of function, time, task and reward. However the HRM paradigm has to be treated with utmost caution. The assumption on which it depends mean that only a few companies will find it feasible, and even they will require a supporting set of structure. To have a corporation-wide mutually reinforcing set of HRM policies in an organisation operating in a highly diverse product market; and to create an organisational culture which pursues both individualistic and teamwork policies at the same time is a very difficult task, if not impossible. Today HRM is increasingly becoming a common term in the business world. Yet how much substance lies behind this terminology is still a matter of debate. Opinions still vary on the extent and pace of adoption of the ‘real’ HRM and the kindest conclusion that can be drawn is that the HR function has some way to go before it really becomes a part of the management of the new millennium. 1. Armstrong, M. (1991) : “ Personnel and the Bottom Line ” : London : Kogan Page. 2. Beardwell, Ian. and Holder, Len. (1997): “ HRM - A Contemporary Perspective ” (2nd ED.) : Pitman Publishing. 3. Beer, M. and Spector, B. (1995) : “ Corporate wide transformation in HRM ” , in R. E. Walton and P. R. Lawrence (eds. ), “ HRM : Trends and Challenges ”. Boston : Harvard Business Review. 4. Guest, D. (1991) : Personnel Management : The end of orthodoxy? : “ British Journal of Industrial Relations ”, 29 (2): 149-76. 5. Legge, Karen. (1978) : “ Power, Innovation and Problem Solving in Personnel Management ” : McGraw Hill. 6. Legge, Karen. 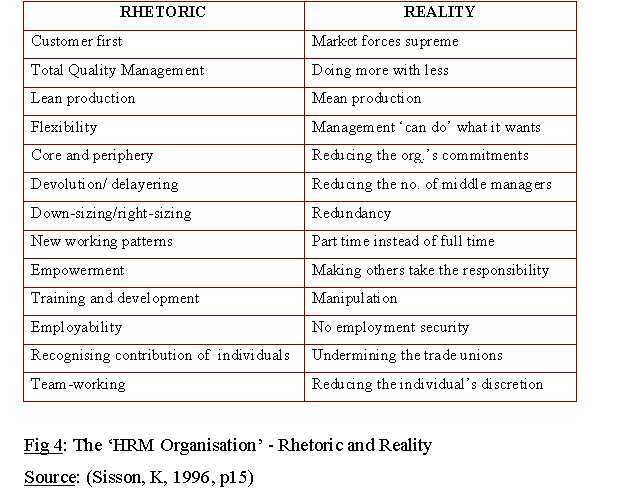 (1995): “ HRM - Rhetorics and Realities ” : Mac Millan Press Ltd.
7. Pike, Chris. and Grenham, Mary. (1997) : “ Human Resources Management - The Study Guide ” : ULH Publications. 8. Poole, M. (1990) : Editorial : HRM in an international perspective, “ International Journal of Human Resources Management ”, 1 (1). 9. Sisson, Keith. (1990) : “ Introducing the HRM Journal ”, HRM Journal, 1 (1). 10. Sisson, Keith. (1996): “ Personnel Management A comprehensive guide to theory and practice in Britain ” : Blackwell Publishers. 11. Storey, John. (1987): “Development in HRM : An Interim Report ”. Warwick Papers in Industrial Relations No: 17, Coventry Industrial Relations Research Unit. 12. Storey, John. (1992) : “ Developments in the management of Human Relations ”, Oxford : Blackwell. 13. Storey, John. and Sisson, Keith. (1996): “ Managing Human Resources and Industrial Relations ” : Open University Press. 14. Storey, John. and Sisson, Keith. (1996) : “ Limits to Transformation: HRM in the British Context ” : Industrial Research Journal, 2, (1). 15. Torrington, Derek. and Hall, Laura. 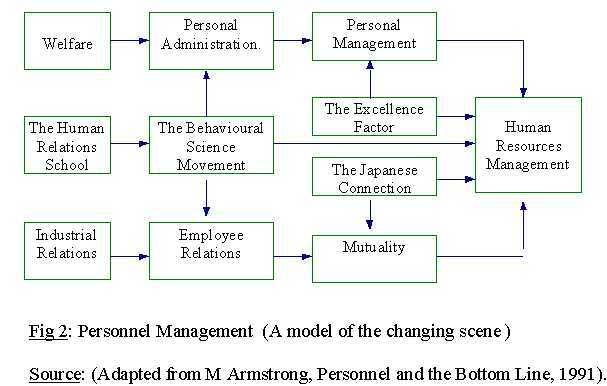 (1995): “ Personnel Management HRM in Action ” : Prentice Hall Europe. 16. Walton, R. E. (1985) : “ From control to commitment in the workplace ” : Harvard Business Review, March - April. 76-84.